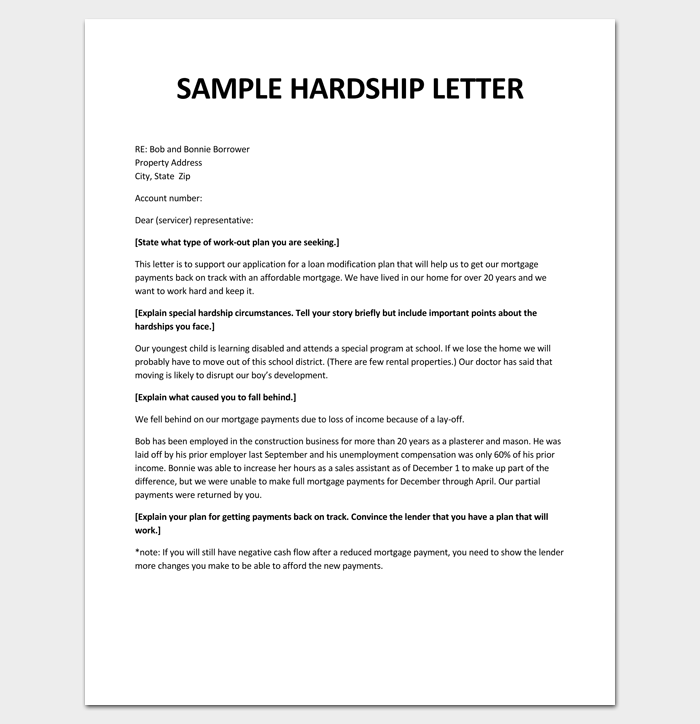 People write hardship letters when faced with various situations that undermine their ability to meet their financial obligations. 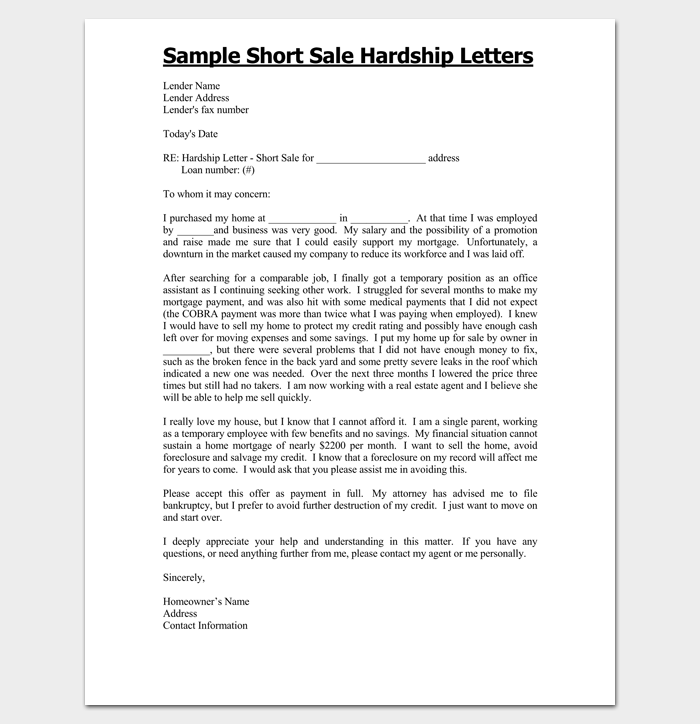 Hardship letters are written in a particular format depending on the situation experienced by the writer. 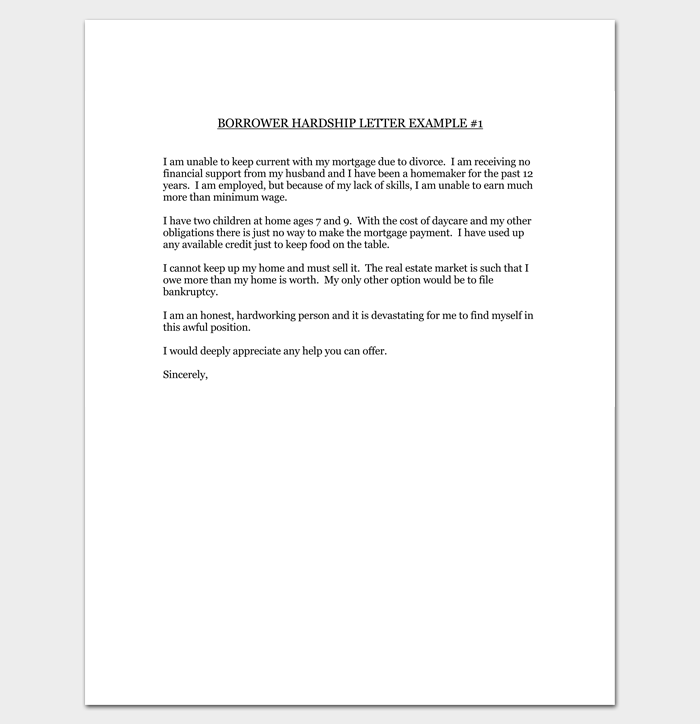 The borrower uses the letter to convince the lender to modify the payment schedule to avoid foreclosures or other punitive measures. An example is a case where one is unable to finalize mortgage payments because of an involuntary reduction of income or as a result of increased financial obligations. It can also be as a consequence of the demise of a contributor, lay-off, permanent or temporary disability or salary reduction. In some cases, the borrower could be facing problems due to natural disasters, divorce, increase in the property tax or even unexpected funeral costs for an uninsured member of the family. 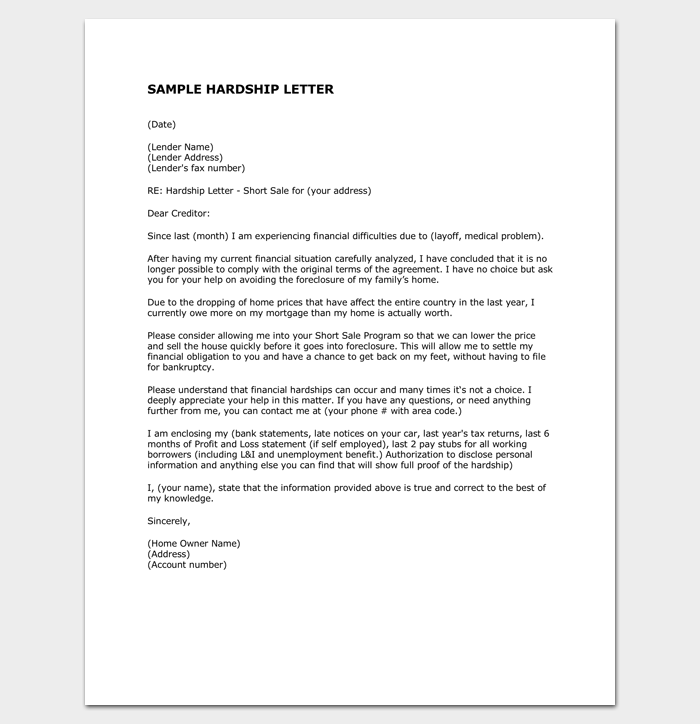 To be able to convince the lender, the writer can use our hardship letter template or the sample provided here. 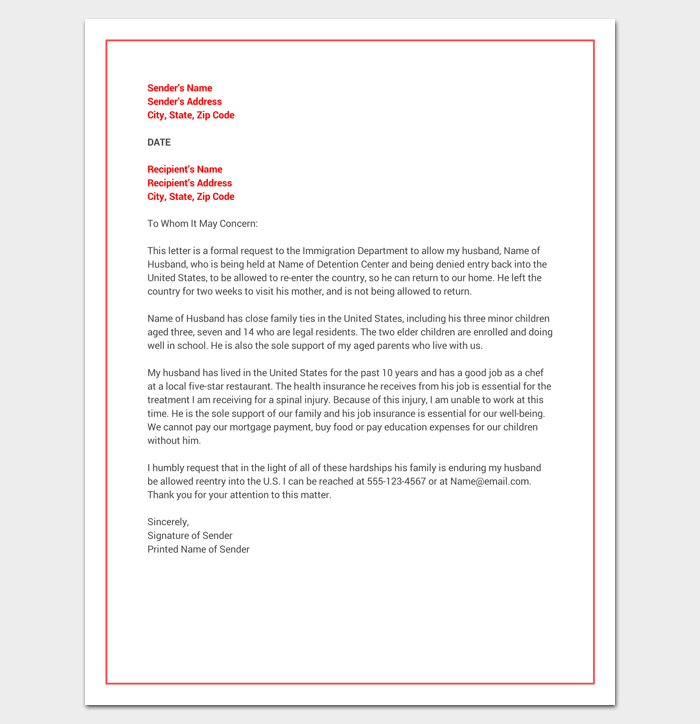 A Medical Hardship letter template is written in cases of emergency or illness that require expensive treatment and rehabilitation. 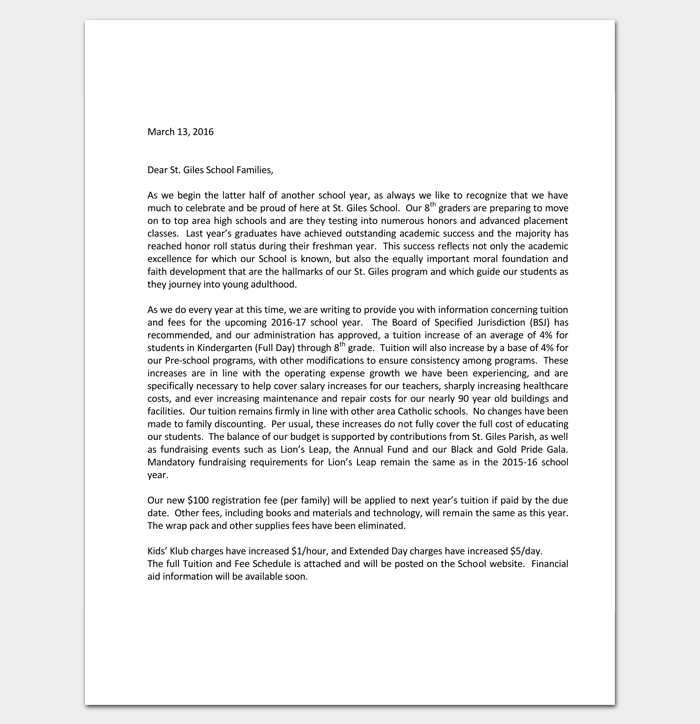 The letter is written to help negotiate the outstanding bill and aid in the reduction of medical bills. 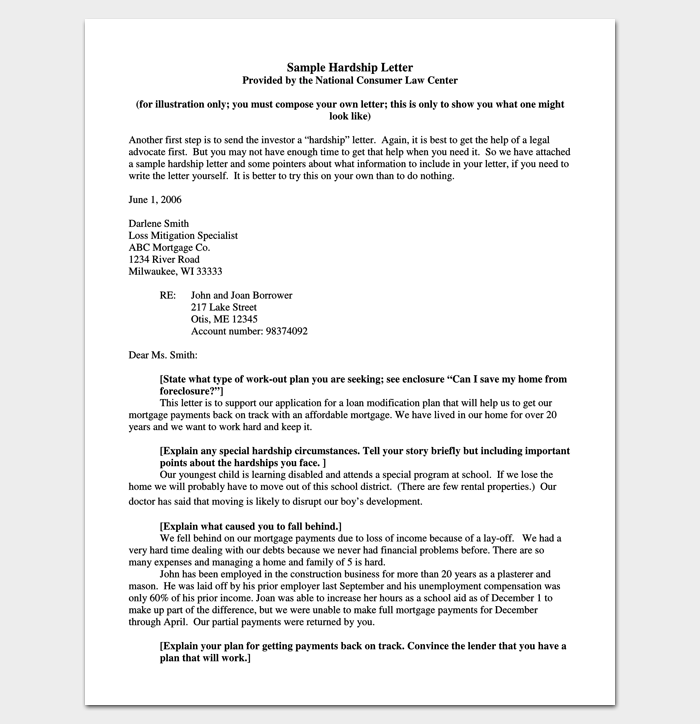 A hardship letter for immigration helps people who are due to be deported out of the United States. 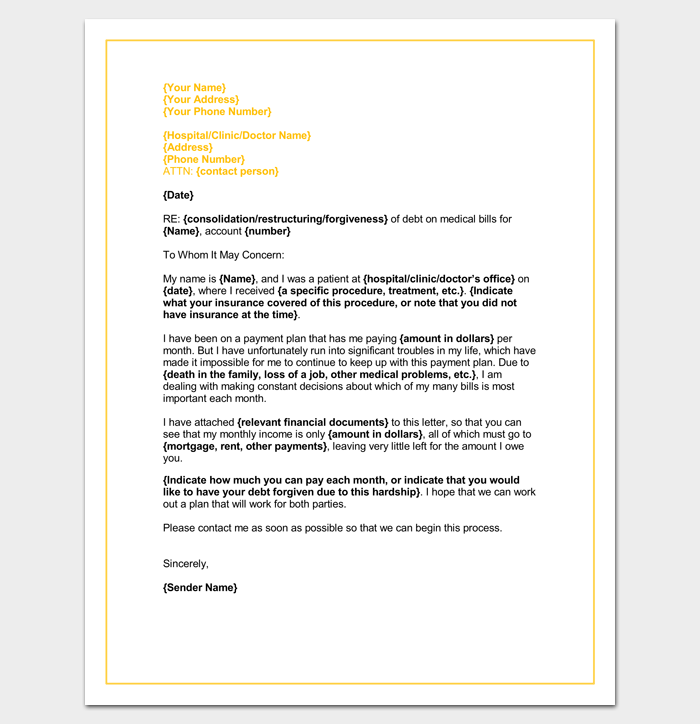 A hardship letter for a loan modification is important when the borrower fails to repay the loan within the loan duration. It helps the borrower to renegotiate with the lender and avoid foreclosures or repossession of property as an investment security. It explains the current issues affecting the borrower’s financial standing. 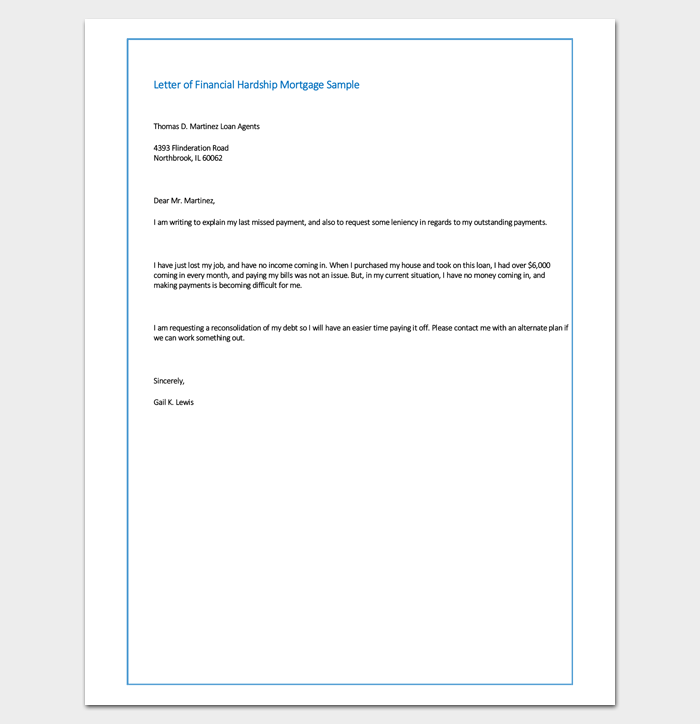 I am writing this letter to explain the reasons behind my inability to service our mortgage. 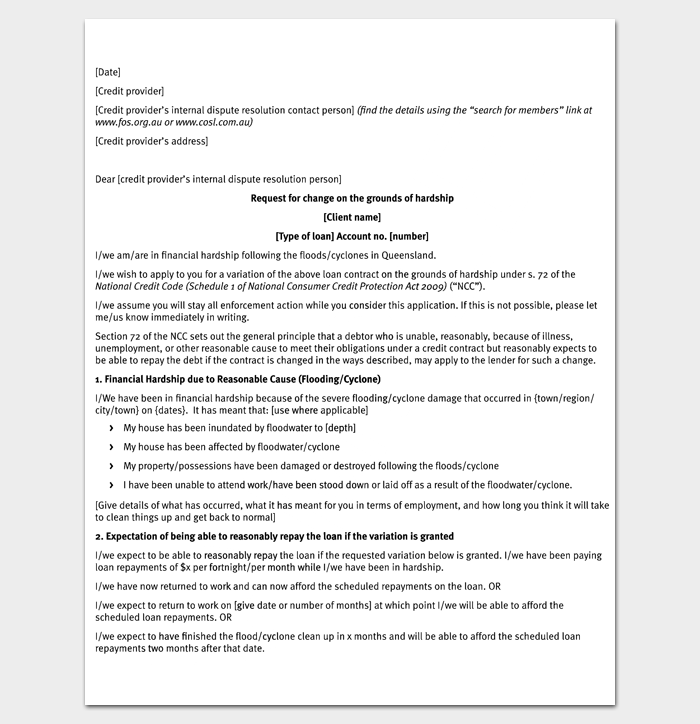 We have put in all efforts to meet our part of the deal, but unfortunately, we have failed and therefore kindly request you to consider modifying our loan. Our primary concern is retaining our home and would appreciate if granted the opportunity. The main reason that hindered our active payment was the sudden death of my husband, who happened to be the principal borrower. The unfortunate incident left us without the primary breadwinner and financier thereby leaving all debt on my hands. After his death, my income has been insufficient, and I have fallen further behind the payment schedule. Sadly, it has reached a point where I cannot afford to pay the amount owed to the (lender). It’s my wish and intention to pay in full, but at this moment I have exhausted all my financial sources, and I am kindly asking for your help. Over the past six months, my situation has improved because I have gotten employment as an executive bank manager and I feel a loan modification would be of benefit to both of us. 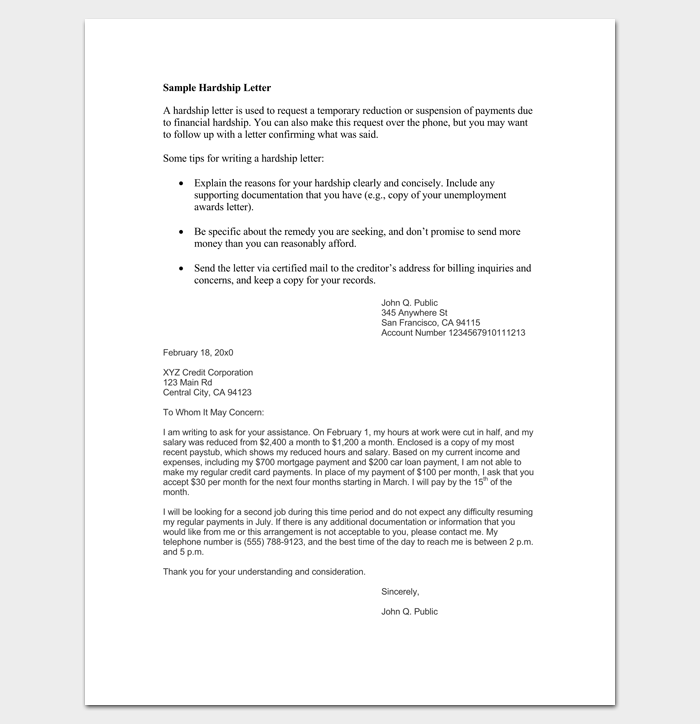 Finalize by explaining what you want the lender to do for you. 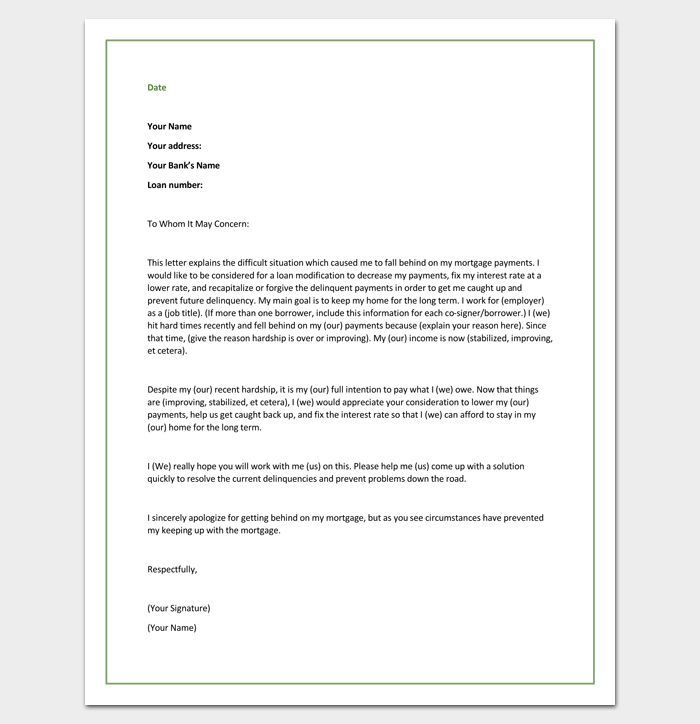 I would be glad if you can work with me to lower the payment of the owed amount so that I can keep our home and also amend ties with your firm. I sincerely hope that you will consider working with me and I am anxious to settle this issue so that I can move on happily.